A party of fishmalks didn’t work even two decades before anyone even knew what a fishmalk was. We next learn the following about combat in Arduin, over several pages of teeny-tiny type, in no particular order… just Dave’s jotted notes, sometimes brilliant, sometimes mind-boggling, always entertaining, one after the other. Like I keep saying, reading this is like having Dave in your living room, guzzling your Mountain Dew and nomming your Cheetohs, while he tells you what he thinks and how to play his kind of game. Magic weapons can hit anything, as can technological energy weapons, but pistols cannot hit “undead types” — I interpret this, in context, as meaning “bullets don’t stop it!”, but lasers do. Works for me. Silver weapons and bullets can hit “all undead types”. Clearly, Mr. Hargrave had not seen Love At First Bite (actually, it probably wasn’t out yet). Magical/mythological creatures can always hit all other creatures, even if they go gaseous, etc. However, normal creatures can never hit magical creatures. The example of a “normal” creature is a 20 hit dice giant spider(!). If 20 hit dice giant anthropoids are ‘normal’ in Mr. Hargrave’s world, it indicates he was born in Florida. Undead (save for zombies and skeletons) can always see invisible, so if you try to hide from a vampire that way, “you may end up an involuntary blood donor”. Golems are immune to normal weapons and to most magic, but if you hit one with a fireball and then an iceball, it will explode, which is good, and then send shrapnel through the room like an artillery shell, which is bad. If you drink a potion of strength, since your bone structure, etc., is not transformed to handle the increased power, you will probably break bones and tear yourself apart “unless the user is damn careful”. No specific rules are provided, of course, just an open license for the DM to be a sadistic little bastich… as if we needed such license. Ah, here’s the “final effort” thing from the turning undead chart… you can channel all your strength into your wisdom (I don’t know if that literally means ‘add your Strength to your Wisdom to get a bonus’, or if it’s metaphorical), but you can’t fight for a number of melee turns equal to your strength (so, the stronger you are, the longer it takes you to recover?). Undead are only repelled by holy symbols of their own religion, so, like that guy in “The Mummy”, you’d better cart around every one you know of, just in case. Beasts that stone people can only be stoned by their own kind, except in Washington and Colorado, or if they have a note from their cleric. Fireballs and other AOEs divide their damage among all targets in the area, which, sadly, doesn’t make a lick of sense… and since this comes from an era when “simulationism” and “verisimilitude” were not dirty words, blasphemy unto Ron Edwards, that matters. As written, and it’s a pretty clear rule, esp. for Arduin, if a fireball does 20 points of damage and there’s four people in the blast radius, each takes five… but if there’s one, he gets all 20. Huh? There’s a nifty little block of rules on how to handle unintelligent monsters’ combat choices. It helps avoid charges the DM is out to “get” a player. In general, all the rules in this section make it clear play was with “paper and pencil and miniature figures”. I got your “theater of the mind” right here, buddy. As the dead horse beatathon continues, it’s really fascinating to see this slice of history from smack-dab right in the middle of the transition from “D&D as a new wargame” to “D&D as the first of a new genre”. To keep up with my evolutionary analogies, let’s call it the Archeopteryx Moment of the culture… the point where something is mid-range between two things. This is where “RPG Culture” really began to distinguish itself from “Wargame Culture”, where you started getting more and more players who didn’t have a wargaming background at all, but came in from SF, fantasy, and comic fandom. Now, we head into more specific, detailed, combat rules. I’m just going to include a few snippets that are typical of the level of detail. 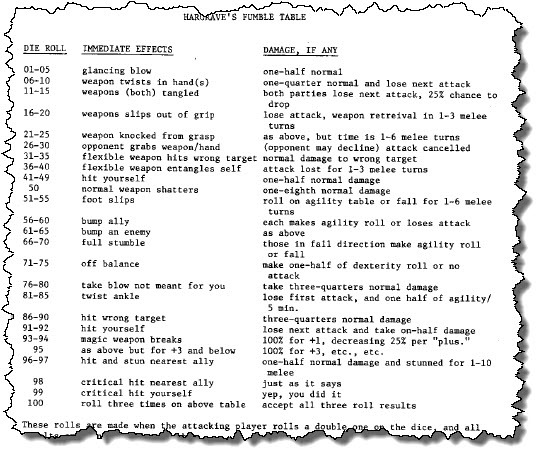 These help show that, at the time, the response from most of D&D’s audience to its simple, abstract, system (which was derived from wargame-style CRTs (Combat Result Tables, not Cathode Ray Tubes, ya idjit!) was not “This is a gem of pure perfection, needing no further details, that frees our imagination to soar on wings of fancy to realms of pure storytelling bliss”, but was, rather, “M0AR R00LZ NA0W!!! !”, except, better spelled, because back then, you couldn’t get away with being an illiterate moron as easily as you can today. But What If Two Of Them Are Halflings And Is An Ogre? Too Simplistic. I Want Modifiers For Bucklers, Round Shields, Kite Shields, and Different Kinds Of Shield Material. OK, That’s Pathfinder. But I Digress. Hargrave Invented The Six-Second Round AND The Armor Check Penalty 23 Years Before D&D 3.0! Damn, I love this guy’s art. Anyway, there’s five more pages of combat tables, weapon vs. AC modifiers, hex facing rules, and so on. I think I’ve covered the style and tone well enough for now. They mostly replicate, with minor changes, “that other game system”. And I just found out to get this damn editor to not insert huge white spaces between paragraphs. Cool. 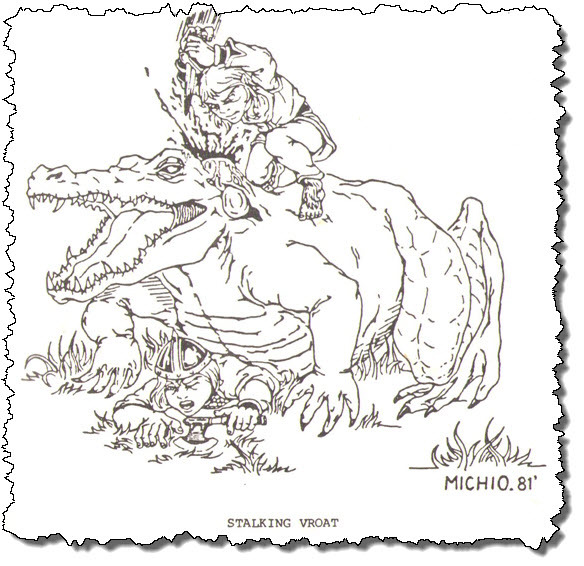 While not as hilariously gory and sarcastic as the Rolemaster charts… no tripping over imaginary turtles… this did add an element of blood-soaked fun to the mundane massacres of monsters. In one game we played, a halfling rolled a “100” critical on a centaur. I ruled the halfling had actually stabbed the centaur in the foot, but the creature reared up and smashed his head on the ceiling. So it goes. For a roll of 100, it says, “irrevocable death results”. This seems a bit odd in the context of the time, when everyone was walking around with wishing rings, and there was even a spell in this very book, “Gathering the Sheaves“, which would bring together all the parts of the body for a quick raise dead. It’s telling, though, that even at this early stage of the game’s evolution, the “revolving door afterlife” was starting to irk people. 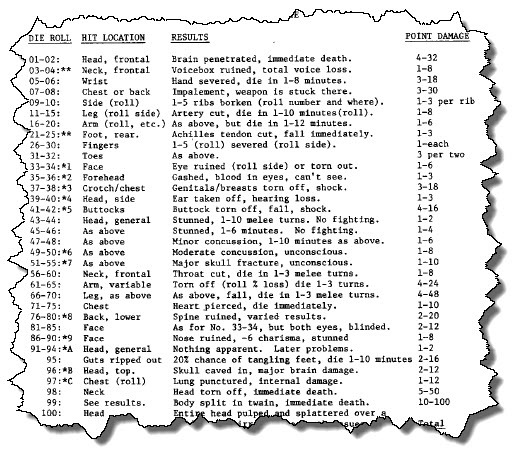 There’s a matching critical fumble chart, of course. I am not sure what’s meant by “rolls a double one on the dice” — does that mean, rolls a 1, then, rolls again, and if it’s a 1, it’s a critical fumble? There are no actual rules I can find in the Grimoire for when something’s a critical hit, either… we just assumed a roll of ’20’ meant a critical when we played. You almost never saw this level of detail for melee fighting, though. Combat systems for D&D (and its close evolutionary kin) where you picked a specific attack and a specific defense were not common. I won’t say there were none, because the mad surge of creativity that defined this era produced so much, so fast, that no one, not even an obsessive collector like myself, could hope to see it all, but they weren’t widespread and none seemed to rise to even local prominence. Well, that’s it for now… next time… were-centipedes and dinosaurs. I’m loving these blog posts – thanks for writing them! I think I can shed some light on the “double 1” fumble thing. Back in the day, 20-sided dice weren’t numbered 1 to 20, but 0 to 9 twice. IE, percentile dice. Before them darn kids with their crazy new-fangled “d20s” came along, to generate a number from 1-20 you rolled a d6 and a single percentile die. If the d6 read 1-3, you read the percentile die as is, taking 0 to be 10. If the d6 read 4-6, you added 10 to the percentile die, for a result from 11 to 20. So, a critical with a 6 and a 0 could be super-awesome, and a fumble with a 1 and a 1 would be super-bad. I still like to use this d20 rolling method at cons to scare the young ‘uns. Plus rolling two dice is twice the fun! A pint of Rumble Tummy’s to you, sir! Just love the viciousness of the text…calling out “turkeys” and “idiots.” Makes me want to write something along those lines…um, thought perhaps under a pseudonym. You’re right: great art from that guy. Oh, and the original Top Secret had a fiddly HTH system like what you describe, very different from the shooting combat.